Our hunt began with the opening of the first New Mexico rifle season on October 4th. I was hunting with my good friends Richie Bland & Dennis Spence. It had been many years since the three of us got together for a little elk hunting at Rancho Lobo, near Chama. Although the weather was a little wet, the first morning’s hunt was action packed with many bulls bugling across the ranch. The sounds of fall were complimented by some of the most spectacular fall colors I had seen in several years. I have noticed over the years, that peak rut for the elk often coincides with the peak of the fall colors. It seemed we had timed both perfectly. As Cade, my ranch manager/cameraman, made our way down a ridge on the west side of the ranch, we could hear a herd bull ahead of us several hundred yards. Not only was he being very vocal, but so were his cow, making it easy to follow their progress as they fed among ahead of us. Cade felt he knew which bull this was but before we could catch up with him, he and his cows had made their way to the neighboring properly, so we made a new plan. Changing directions we began to hunt our way east, up another ridge of mixed conifer and aspen. It wasn’t long until we were back in elk, hearing three different bulls sounding off. With a few cow calls we had two young bulls trotting towards us. These were classic satellite bulls, too young to take over their own harems of cows, but plenty old enough to be very interested. One of the bulls came to within twelve yards in his search for the cows he had heard. It is always thrilling to me to be so close to an animal like this in the wild, with him having no idea we are there! This bull hung around for several minutes before wandering back the way he came. After their departure, we continued on to the next group of bulls we could hear further up the ridge. After fifteen minutes of uphill climbing we began to catch up with them. It was a game of cat & mouse as we tried to parallel this herd of cows, calves, and bulls without the seeing or smelling up. By the sound of one of these bulls he was definitely worth checking out. When we finally caught up to him we were not disappointed! 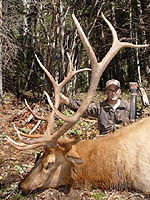 He as a 6×6 with well developed points and dark, heavy antlers. 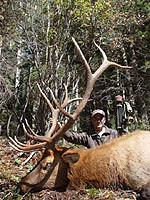 I felt he would score around 290 which is good for the Chama area, but not good enough to try for on the first morning. As we felt this bull was probably the best one in this herd we decided to back out so as not to spook them. Since it was now getting late in the morning, we began our return to camp. Not long after making it back to camp, the rain hit hard, and carried through the afternoon. I decided the best choice was to stay in camp with my wife, Chris, and some of our other friends. Although my morning did not result in the taking of a bull, that was not the case with Dennis! His story can be read on the site as well. Sunday broke clear, calm and cold. I decided to try a hunt that I like to make every year which begins at the top of the ranch and ends two thousand feet lower, back at camp. The idea of this hunt is to work down the ridge staying right on its back. In the morning the wild is always going downhill, but by staying on the spine of the ridge you can work down below any bull you hear, then come in on him from the side. Usually the hunt starts off slow as the elk are still working their way up the mountain from their favorite feeding locations. This morning was no different, but we could hear one bull not too far below us. We quickly propped down to get the wind and began our approach. He was bugling frequently so it was not necessary to call. I always stay as quiet as I can, saving any bugles or cow calls for the moment when I will really need them. Many elk are so educated, especially cow elk, that they will move away from any calls they cannot identify. Soon we were less than 100 yards from the bull with only the small ridge between us. As I eased over the lip I could see the bull bugling in the first light. He was magnificent as he tilted back his head and emitted his clear crisp call with steam streaming out of his mouth. One or two cow calls was all it took to get him moving our way. He passed up the hill at about 35 yards as I waited with an arrow knocked on my Bowtech Tech 29. I could have taken him easily if I had wanted, but he was not yet mature scoring somewhere around 260. He gave us a wonderful show as he paraded back and forth in his search for the invisible cow he had heard. Without disturbing him we slipped out below his line of sight. The next several hundred yards proved to be unproductive as we encountered an area without much activity. Today I was hunting with Aaron, our ranch biologist, and both of us knew good things were in store by the sound of the elk heading our way. We began closing the distance on these animals and experienced several incidents where it seemed impossible to get the wind in our favor. Although we saw three different bulls at a distance, we were unable to get close to them before they caught our scent. I knew as we continued down the ridge the terrain became slightly steeper which would make it easier to play the wind. Our timing ended up being perfect as we arrived in the favorable area at the same time as a group of elk with some extremely enraged bulls! We literally had animals on all sides of us, some as close as ten yards, all the bulls were screaming and mooing around the herd bull as he attempted to guard a hot cow. I have been fortunate to penetrate this type of activity only five or six times in my life. Once on the inside, it’s almost as if they pay no attention to you, so great is their concentration on pursuing the cow and each other. Many animals were feeding inside twenty yards of us but were unaware of our presence. The herd bull was a definite shooter with heavy beams, dark antlers with ivory tips, and six well developed and unbroken points on a side. He really had his hands full as their were no less than seven other bulls vying for this cow. I was certain it was just a matter of time before he passed through one of several shooting lanes I had identified. Several times he stopped inside 35 yards but was always blocked by trees, brush, or other animals. For more than fifteen minutes we were in the eye of the “cyclone”, I call it. Although a shot opportunity never presented itself, it was one of the most exciting times I have experienced while hunting elk, and is a memory I will not soon forget the video we taped of this event will definitely appear in the new “Big Game” tape! My manager, Cade, and I were up early and ready to make another assault on the ranches bulls. Our plan, this morning, was to drive to the north side of the “Honey Hole”, a series of meadows located in the lower central part of the ranch. From there we would attempt to parallel the various groups of elk moving up the ridges to their morning beds. Bugling activity was strong as we left the vehicle and began moving up the ridge on the edge of the meadows. As we continued to advance the light began to increase as the sun crept closer to the mountain tops it was necessary to move carefully in the low light conditions, as the cow elk had a much better chance of spotting us tan we did them. As we closed in on the first group of elk we could see a very nice 6X6 bull doing his best to keep this group of cows rounded up although a nice bull, he wasn’t what I was looking for, so we skirted to the bulls that were already further up the ridge. Try as we might we could not seem to gain on these bulls. We did get to see two 5X5’s which came easily to my cow calls. As we paused to assess our best plan of attack, Cade and I could hear a bull down the ridge. He seemed to be moving up in our direction, and did not sound as if he was one of the bulls we had already seen. Quickly we found a spot that would offer us both cover and some shooting lanes. I debated silently about the idea of cow calling, and finally decided to hold off. Right now this bull had no idea we were there, and as long as he continued to advance, it seemed best to remain quiet. After several encounters over the last two days where luck was not with us, everything appeared to be going our way this time. My biggest concern was the wind. If the bull walked up the hill and stayed to the right, or uphill of us, we were fine. If he walked straight at us we were fine. But, if he came to our left, on our down hill side, I was certain he would wind us before I could take a shot. Long moments passed before we finally spotted him coming up the ridge. At just under eighty yards the bull stepped between two aspens and revealed his impressive 6X6 rack. As he moved closer there was no doubt in my mind I would shoot this bull if the opportunity presented itself. I turned to Cade who was busy videoing the action, and told him so. The bull slowly continued his advance, stopping to bugle every few steps. He was moving right at us! I readied myself for what appeared to be a “straight on” shot opportunity. At about twenty yards the bulls head disappeared behind a large aspen and I came to full draw. He kept moving right at me until, at 13 yards he stopped to bugle. I settled my 20 yard pin about 4 inches into the dark neck ruff and, just as he was finishing his bugle, touched off the release. I saw the arrow bury deep in his chest as all hell broke loose! The bull reversed course and went tearing through every thing in his path, breaking limbs as he went, in the blink of an eye it was over, and all was again silent, save the bugling of the other bulls now well up the ridge. It is hard for me to describe the excitement I had been feeling for the previous five minutes! Cade and I celebrated the thrill of the moment, much the same as two scuba divers do just after returning to the surface. We compared notes on everything we were seeing and feeling during the tense moments leading up to the shot, when speaking to each other was not possible. Having spent a good deal of time behind a camera myself I knew Cade was as excited as I was. Within ten minutes we had recovered our composure and were ready to get serious about the big bull’s blood trail. For me, getting on a blood trail is like landing a plane it requires full concentration I do it in such a way that all options possible are left open to me. I do not rush the job and I always assume the animal may be alive, so I move slowly and quietly until I have confirmation my prey is dead. In this way I can be in a position to take a finishing shot if necessary. As I moved forward on the blood trail I could tell a second shot would be unlikely. Massive quantities of blood led me to believe the jackhammer mechanical had severed the jugular as it sliced into the boiler room. Within 150 yards we spotted the downed bull. As we approached, the antlers seemed to grow, always a good sign. My New Mexico bull ended up scoring right at 300 points by the Pope & Young method, making him the twentieth bull I have taken that would exceed their minimum requirements. 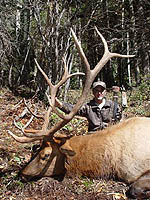 As I think back over each and every one of my archery elk kills, I cannot recall any that were more exciting!